There are a few new interface updates in Patch 5.1, many of which have been suggested by players. With the addition of the Pet Journal and ability to have duplicates of certain pets, the "Already known" error message on pet tooltips was removed. This was somewhat frustrating for players seeking to purchase pets, but had trouble determining if they already owned that companion. In the upcoming patch, tooltips will show how many of that specific pet you have in your collection. The number will show up on both caged and non-caged pets. If you've collected the maximum number, this text on the pet's tooltip will turn red to indicate that you can't add that companion to your collection until you're under the cap. Many players are currently using addons that show the quality of wild pets during combat. This convenience has been implemented into the Pet Battle UI in 5.1! The border and name of each wild companion will appear in the corresponding color of the pet's quality during a battle. 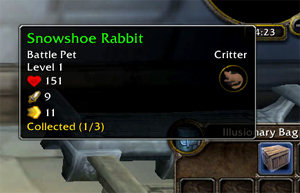 You'll be able to view what quality each pet is before you capture them, and without the aid of an addon. The quality of your own pets will also be shown in the Pet Journal. This includes wild pets and older, pre-MoP companions. Another new addition to the interface is the addition of pet levels for each zone on the world map. Just hover over each zone, and the level of the wild pets found there will be shown underneath the zone name. Zones that exceed your current pet team's level will show up in red text (pictured above). More level appropriate areas will appear in green and yellow text, much like quest levels appear in the quest log. There are other updates coming in Patch 5.1, such as more filtering and sorting options in the Pet Journal. With all of these Pet Battles UI changes, this wonderful mini-game is set to be even more enjoyable in the next patch!